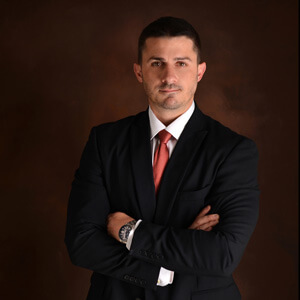 For over a decade, Attorney Gregory E. Nassar has been offering quality legal representation to victims of motorcycle accidents, auto accidents, personal injury, defective products and other various practice areas. Click here for your Free Houston Accident Checklist Kit! With a professional reputation that is unmatched in the legal industry, Nassar Law strives to make quality representation available to everyone regardless of their case, demographic or financial status - we stand up for Houston victims like you! If you or a loved one has been recently involved and critically injured in a collision in the Houston, Texas area due to someone else’s reckless behavior, call on Nassar Law. 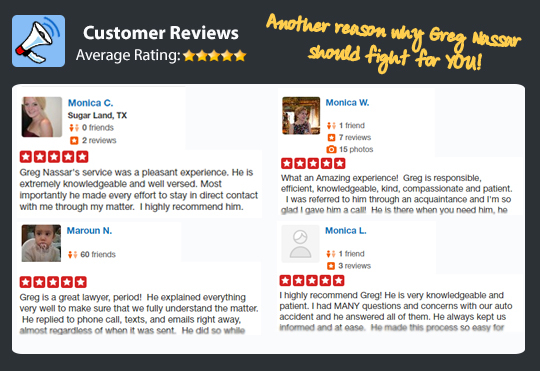 Our top personal injury accident lawyer, Gregory E. Nassar, helps victims like you get just compensation for injuries and lost wages. Over the last ten years, we have received recognition due to our favorable settlements and verdicts, as well as for our compassionate and thoughtful approach to personal injury services. When responsible parties refuse to admit their wrongdoing and when insurance companies refuse to pay, we fight for you! Nassar Law understands that being involved in a motorcycle or car accident can be an extremely harrowing experience in the Houston, TX area. In addition to the physical pain, you may also be struggling to pay the mounting medical bills. Don’t worry! There are certain legal rights and options available to citizens of Houston, and we can run you through each of them with our FREE Case Evaluation. If you have questions about how much a fair settlement would be or how much the worth of your insurance claim is, we will give you straight and simple answers. A rear-end collision often occurs when a driver follows too close to the car in front of them. In this type of traffic accident, the driver behind you is almost always held liable for the accident. This type of collision involves the front ends of two vehicles hitting each other. Head-on collisions are often fatal. Also called T-bone collisions, this type of accident happens when the rear or front of a vehicle collides with the side of another vehicle. This occurs when the sides of two parallel vehicles touch each other. Often, the vehicles only suffer light to moderate damage to the body. This type of collision involves a vehicle flipping over onto its roof or side. This often happens to cars with a high center of gravity (e.g. SUVs). Also known as pileups, multi-car collisions involve several automobiles. This often happens on freeways, and injuries or fatalities are common. This occurs when only one vehicle is involved. Often, this involves a vehicle striking inanimate objects, such as poles, trees, walls, and fire hydrants. In Texas, crashes occur somewhere in the state every 66 seconds—one resulting in an injury every 133 seconds and a fatal accident every 149 minutes. Drunk driving, distracted driving, and speeding are some of the leading causes of traffic accidents in Houston, Texas. Drunk driving is the biggest cause of serious accidents in Texas. A goverment study showed that drivers were intoxicated in nearly 24,000 crash injuries in one state in 2012. Alcohol-related accidents claimed 1,446 lives in Texas in 2014. In 2017, there were 537,475 reported motor vehicle traffic crashes in Texas. Approximately 19% of those involved distracted driving, which resulted in 444 deaths and nearly 3,000 serious injuries. In one state, 54% of drivers said they had been nearly hit or hit by a car whose driver was using a mobile phone. Statistics from the Texas Department of Transportation show that speeding contributed to 125,000 accidents in Texas in 2014. Driving a car is no child’s play. No matter how careful you are, if other drivers are negligent, accidents could very likely happen. 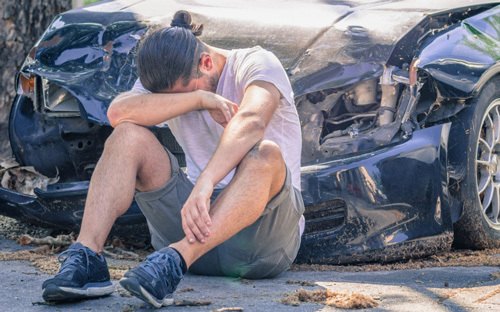 At Nassar Law, an accident injury law firm serving Houston, Texas, we help people injured in motor vehicle accidents get the compensation they deserve, as well as hold negligent drivers accountable. Our ultimate goal is to keep the roads and highways safe for everyone. Gregory E. Nassar has handled numerous such cases in Orange County, California and Houston, Texas. When he handles your car accident claim, he will try to settle and fight for your rights with the responsible party and insurance company. He will also represent you in court and make a solid case to get you the maximum possible compensation. A car crash can destroy your life. Not only does it cause injuries, but also result in mounting medical bills and cause you time off from work. You need an experienced personal injury accident lawyer, and you need one now. 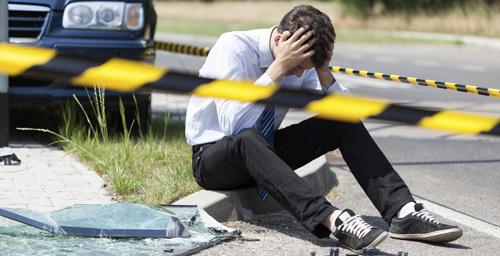 Note that if you have been involved in an auto accident in Houston, TX, you should speak with a lawyer as soon as possible, as you only have a limited amount of time to seek compensation under the law. So don’t wait. Contact Nassar Law to schedule a FREE Case Evaluation today!